"This recipe is a family favourite because we grow most of the ingredients ourselves! Squash is healthy, tasty and easy to grow, plus I love sharing it with our neighbours and friends. 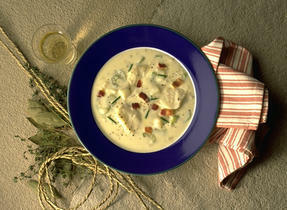 -"Recipe from Marian Mac Lellan from Antigonish, Nova Scotia. "We’ve farmed for 28 years, and we’re about to pass on the farm to a new family. We’re overjoyed that they’ll continue the traditions we’ve worked so hard to build." Feel like trying a new soup recipe that's easy to make? 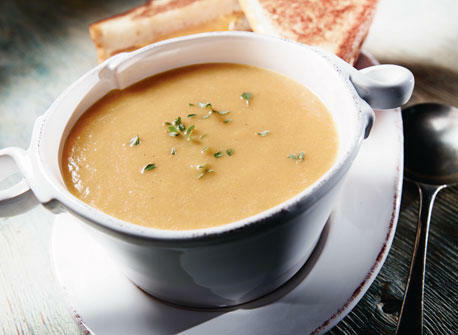 How about an invigorating cream of squash and apple soup as shown in the video. The curry powder, squash and apples blend perfectly, delicately releasing their aromas and flavours as the soup simmers. In large pot, melt butter over medium heat. Add onion and garlic; sauté for about 5 min or until softened. Stir in curry powder, squash and apples; sauté for 2 min. Add chicken broth, cover and bring to a boil. 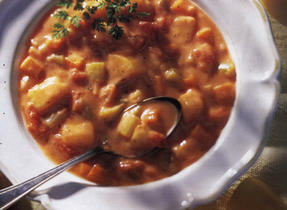 Reduce heat to medium-low and simmer, covered, for 15 to 20 min or until squash and apples are soft. Using an immersion blender in pot or transferring soup in batches to an upright blender, purée until smooth. Return to pot, if necessary. Stir in warm milk and reheat soup over medium heat, stirring, until steaming (do not let boil). Season to taste with up to 1/2 tsp (2 mL) salt and pepper. Ladle into warmed bowls. Choose a squash that feels heavy for its size and had firm, smooth skin with no sign of wrinkling for the best texture and flavour. Omit the curry powder and stir in 1 tsp (5 mL) chopped fresh thyme with the milk in third step. 268 people love this recipe.